Sit-in demonstration at Dikoli in 2008. The people of Dikoli village know how to fight. Already 30 years they are struggling for a job. They had rallies, they were in jail, but still they go on. The government has to keep its promises: a job for every family. 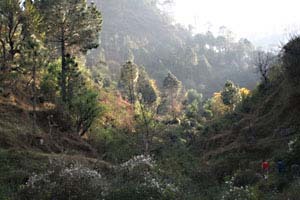 Dikoli is a village just between Theri and Uttarkashi in the Uttarkashi district of Uttarakhand. The nightmare started about 35 years ago with the announcement from the government to build a 300 Mega Watt power station. Just where the village is. 28 years ago the construction started. People with land got compensation: 44,000 Rs per hectare. That’s not that much. When they bought land, they lost it later for the artificial lake for the Theri dam. Again they got some money. But now the money is gone and the land too. 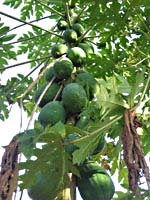 The villagers lost 90 percent of the agricultural land. 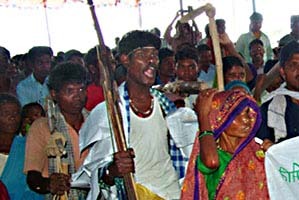 The landless farmer labourers who didn’t have any land, didn’t get any compensation. The power station was ready in 2008. The construction costs increased from 4,738 million Rs in 1980 to 23, 230 million. That is almost 5 times more. The power station is build at the end of a 10 km long tunnel. All houses in the village got cracks by the blastings for the tunnel. The spring in the centre of the village dried up. The soil of the common village pastures lost their moisture. The water mill is not working any longer. The village forest is lost too, because the government decided to build a colony there for the 130 families who came for the construction of the power station. Now the original village people are strangers in their own village because more than two times more worker families from outside are living in their village. The government promised a job for every family, because you need some income when your farm land is lost. Some times some people got work as day labourers, some got a temporary job as a guard or something at the administration, dependant of their education. But nobody got a regular job. With the construction the contractors prefer labourers from far away, from poor states. They are cheaper and when there is a mortal accident, there is no family to ask for compensation. For the power station itself the company needs well trained technicians, not uneducated farmers. Very often the promises of bringing jobs for the local people are not fulfilled. Time and again people went to the administration to ask for the promised jobs. Often the officers sent a letter to the power company to give every family a job. The villagers have a plastic bag full of copies of letters. The organisation HPSS made a list of it. It starts with an official letter of 1973, December 28; 1979, June 27; 1981, January 5; 1981, February 28. And so on, and so on. Every time the administration orders the company to give jobs. Never they did. At 1989, November 3 there was a meeting of the villagers with their member of the state parliament; !990, May 2 a villager with the name Sundarlal sent a letter to the administration that he lost more than one hectare, but didn’t get a job. In th end of March in that year people had a sit in demonstration before the office of the company. later on there was a hunger strike. In the end of April 1991 some villagers got work as daily labourers. But only for 19 days. And so on, and so on. At 2007, July 28, the Kumar family got a letter from the government that a high tension wire will be come right above their house. They had to leave it directly. The struggle is there with letters, meetings with officials, sit-ins and hungerstrikes. In 2009 a group of 29 youngsters was put in Theri prison for 26 days after trying to stop trafic at a bridge. Everytime the administration orders the company to give jobs to local people. But the company doesn’t listen. And the government is not really wanting to force the company to give jobs. HPSS advises the people to contact other villages with the same problems, to start a combined campaign. And perhaps it is better to claim a piece of land from the government and start farming. Dikoli is only an example. In dozens of villages people have lost their land for dam and tunnel projects. Everywhere people are resisting. But it is difficult for them to give enough time to this struggle because they are very busy with their day-to-day survival. 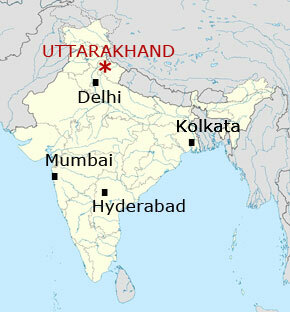 Another problem is people in the Himalayas are living scattered. 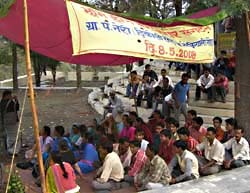 Some organisations (for example HPSS ) bring information from many villages together (for example in the Citizens’ Report about Dams, Tunnels ), and they organise big meetings and rallies (for example in the Save the River Campaign ).